The first experience of love? The beginning of the end – of childhood. *Please note that on the Demo CD the songs are all sung by adults to a piano accompaniment. However, in the performance it is envisaged that Remember When could be suitable for adult and children's voices, including a children's choir and small orchestra. Lyrics for the song cycle Remember When, music by Charles Miller, 1997. Remember When celebrates childhood, in all its aspects, in words and music. 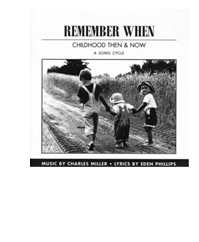 A new song cycle by Charles Miller and Eden Phillips, it harks back to more innocent eras as well as highlighting the characters and interests of today's very knowing kids. Their points of view are paramount, but Remember When also considers the attitudes of parents and grandparents and nannies – even pets and animals. Times and places, hopes and fears, tears and laughter are all evoked in song, always with affection and often with humour. There is no plot as such. The songs jump about in time, place and mood to spark recognition in young audiences and memories in older ones.